We have just received the results of surveys carried out last year using this scheme. This is provided free to selected small and medium-sized enterprises (SMEs) in the Glasgow and Edinburgh areas by a partnership between the Carbon Trust, University of Strathclyde and University of Edinburgh. 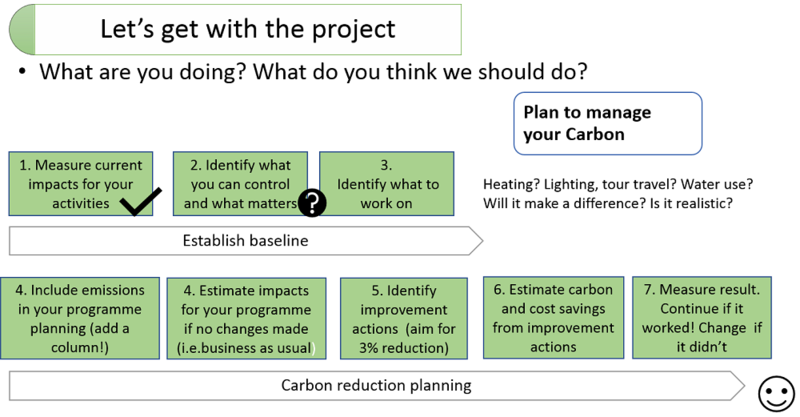 Creative Carbon Scotland arranged for surveys to be carried out on a number of theatres in Edinburgh which resulted in a report which provided a thorough analysis of energy use in the theatres along with detailed recommendations on how to achieve Carbon and cost savings. The programme is now open for next year and is inviting applications from others in the creative sector. It will help you to understand and reduce energy and other costs in your business, providing a clear assessment of your organisation’s carbon footprint and a practical action plan to make savings and take positive steps towards environmental sustainability. More information is available in this description Information on free carbon audit, Edinburgh & Strathclyde 2016-17. Creative Scotland released the Annual Statistical Survey form to be used for 2015-16 annual reporting from funded organisations which, for the first time included a section for reporting environmental data which had to be be completed by all organisations which are Regularly Funded (RFOs). All reports were submitted by 23rd September 2016. During our conversations with arts organisations about how we can reduce our environmental impacts we have often been asked what are the best ways to reduce our carbon footprints and how do we know whether we are doing well? In this report, we’ve tried to answer some of those questions by analysing the environmental data provided last year as part of annual reports to Creative Scotland. This handy infographic sums up information we gathered from over a hundred organisations who now receive regular funding from Creative Scotland (RFOs) to show maximum and typical CO2 impacts. See how many organisations are engaging in environmental actions and where you fit in to the sector. With the help of the BAFTA Albert staff we delivered Carbon Literacy training for screen professionals. We are keen to promote the excellent work done by the BAFTA ALBERT consortium.You can find information on the work ALBERT have been doing as well as case studies and tips on sustainability for screen. Please contact Fiona MacLennan for more information and to arrange attendance at our next session. We created this handy spreadsheet tool to estimate energy use and help with understanding the best opportunities for reductions. Creative Carbon Scotland presented this session in collaboration with the Sustainability in Production Alliance (SiPA) in Scotland at PLASA Focus Glasgow in January 2016. We helped members of the FST Carbon strategy group to explore ways of measuring how well they are managing their carbon budgets with this handy FST Data Collection spreadsheet for calculating metrics like kg CO2 per ticket sold (to name but one). Please contact Ben Twist or Fiona MacLennan for more information.